Simple, quick and light. Throw it together with freshly grilled chicken, or with leftovers. Serve as is, on a bed of greens or in some kind of a wrap. Take it for lunch, to the beach or a backyard gathering. Switch up the ingredients based on what you have, or what you like. I’ve made versions with peppers, pignoi nuts and scallions. Never cut up a mango? It’s easy. Here’s a video tutorial. 1. 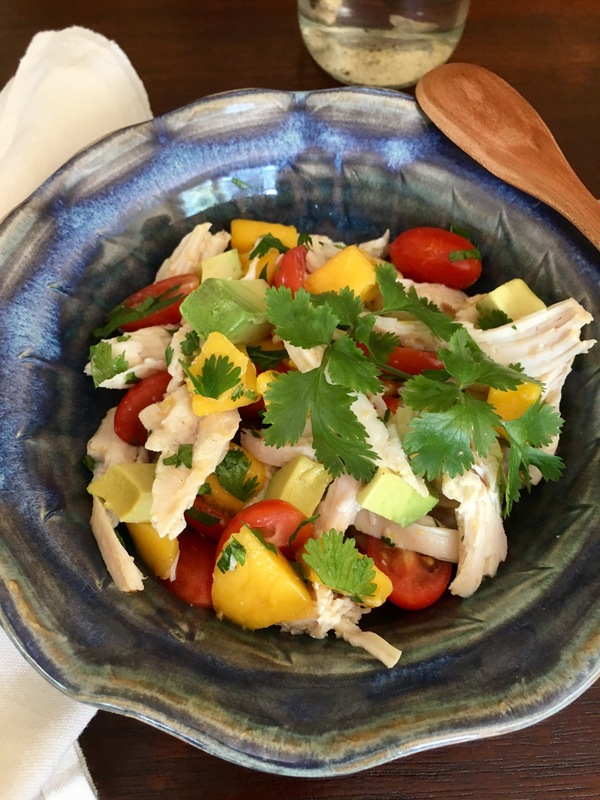 Prep chicken, mangoes, avocados and cherry tomatoes. Combine in a mixing bowl. 2. Add lime juice, salt, cilantro and olive oil. Stir. Taste. Adjust seasonings to keep your palate happy.